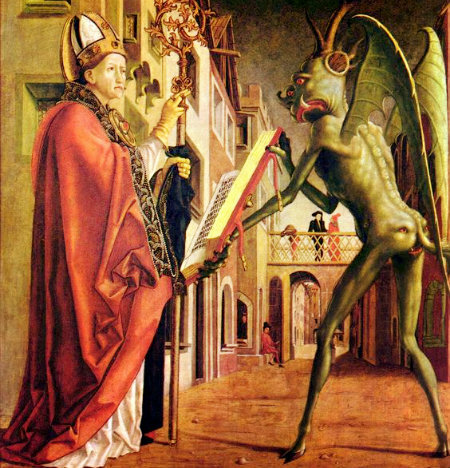 Saint Augustine and the Devil by Michael Pacher, 1471. The devil lies so as to intimidate. But our graces come from God. Even our Faith comes from God, because He wants us to love Him. --I have understood, Holy Archangel, but I will not speak of it. --I will not say it, Saint Michael. --I pass since you are afraid to sin. --Yes, I am afraid to be wanting in charity. --I speak of the order of the Lord. --I will not go back, Saint Michael, if you speak in this way. --Dear friends of God, the Lord is offended by those who should serve Him. --Do not say that, Saint Michael, I will not repeat it. --The friends of God are warned; they only have to wait in silence and in their generous faith. --Good Mother, I am very quiet about it. “Listen, a word for you. Satan boasts that he will crush you under the weight of persecution and of horrible treatment. He congratulates himself and he hopes to take revenge on your hope. --Saint Michael, tell him that he is very foolish if he thinks it. He is again more stupid than foolish. Tell him this from me, and also that I am not afraid of him. --He also says: I would very much like to take at once the friends of the Cross. --Tell him that he boasts too quickly, and that he will fail in his dirty stupidity. Tell him that. --The means to make him to fail, is to not fear him and to laugh at him. --Oh Saint Michael, we know this beast well. --I do not know what this is. --An “evasion” of the friends of the Cross by a very loud noise with which he will make them leave. --Saint Michael, tell him that he has his paws turned backwards, and that he is not capable of making my friends leave. --He says that he will declare war against you, on you, on the victims, and on the friends of the Cross. --Tell him that, when there will only be this Quequet [quequet = little pig] to make war against us, his soldiers will be nothing more than dust. --He says that he is going to arouse a very large stir in this parish, and that he is going to make to come out all that is the most abominable. --Tell him for me, Saint Michael, and for my friends, that he is unable to make any other sort of thing to come out, because he is full of filth... and that filth is his food. --He says that he wants to turn upside down the love of the Cross in all hearts, but he admits that he is on the point of being beaten. That is why his chaos will not be missed. --We do not fear him. That he go with his! He has laughed with his. We have laughed, we, with Jesus Christ. Those who have laughed with Satan cannot laugh anymore with God. --Courage in the middle of all that. I have warned you. --Yes, and I thank you. --Your enemies want to redouble their violence again. --In accordance with charity, I have none. --When the priest who comes here is going to return, with his fatal dispositions, loaded with an authority by an authority without authority, do not trust him. Keep the biggest reserve. --It is all a sudden attack that is being prepared and they are enjoying each other. All of you, you keep a deep silence! It is the most terrible times, it is the fury; but their efforts are very far from being on the way of triumph. The fights are close to all odds. You must suffer again, lift your body to the cross and your soul to the chalice of Jesus Christ. --I am ready. I do not refuse to suffer. Only, Saint Michael, ask for me of Our Lord the grace to be able to endure it well. --If you had seen all of the mountains of sufferings of which you had to be in charge, would you have consented to so much suffering? --Yes, Saint Michael, but I prefer not to have seen them. I throw myself blindly in the Holy Will of my Love. --If you knew what you carry on your shoulders and everywhere! --All of this excites a holy compassion in my soul for those who bloom me. To be blooming from flowers of persecution, how beautiful! --The Lord gives, when he wishes, to all these flowers, a good odour. I stop myself and I repeat: courage to all! --Oh! Good Mother, we do not know anymore what is the consolation here below! --It is in Heaven that it will be enjoyed. Courage, my children... My Son protects you because He has need of you. --My Good Mother, I beg you – I am more bold with you than with Saint Michael – I beg you, tell me, amidst all of my pains, if I do that which the Good God desires. --Reassure yourself, console yourself. My Son has never been more glorified, more than today, by your invisible pains. --Good Mother, the sufferings are all interior. --I will relieve them well, but, since my Son sends me to add one last flower to your crown, I leave you your pains. --It is sweet for me to suffer when I have a word to strengthen me. --Courage! My children, I leave you. [Source: pp. 146-150, Le Ciel en Colloque avec Marie-Julie Jahenny, by Fr. Pierre Roberdel]. Pope Pius IX dies in 1878, and this prophecy takes place in 1879, at the beginning of Pope Leo XIII's rule. The Church has had her Papal States stolen from Her in an act of war by the masonic Italian government. Thus Saint Michael says, “... The heart of the Church ... is but a bleeding wound. Today crime is taken right up to the foot of the aut...”. The unfinished word is likely “authority” meaning, up to the foot of the Papacy, because the Papacy itself is already threatened. Recall that it is Pope Pius IX who says “The vipers are at Our Breast”, meaning that the masons have managed to gain positions among cardinals and other high-ranking officials, in order to try to gain the Chair of Saint Peter for themselves. Sadly, they manage this feat on October 26, 1958, at the Papal Conclave after the death of Pope Pius XII. The heart of the Catholic Church continues to bleed throughout this Exile of Silence where the Holy Father and the small flock under His authority continually suffer, pray, and patiently wait for God to act. Marie-Julie Jahenny, for her part, will not speak of the acts of treason by those pretending to be clerics, and even by those who have truly received Holy Orders. She does not wish to scandalize souls. She keeps silence out of charity. The devil means to crush her spirit, and thus break her courage and conquer her efforts against him. He does so because he knows that he has a powerful opponent in this victim soul. He even does so with us. The devil wants to break our spirit and crush our courage, because he knows that our prayers are powerful also. We, the small flock who pray in communion with the Pope Gregory XVIII, during this painful Exile ... how powerful our prayers must be in Heaven! We will never stop praying in communion with the Holy Father, never. We are with God, and God triumphs over satan. Marie-Julie calls the devil “quequet” which means “little pig” in her local dialect. This shows us that Marie-Julie knows her adversary well, for after Christ frees a poor demoniac, he orders the demons into the pigs, and they have been forever humiliated by the event. Even Shakespeare (in 1606 A.D.) comically alludes to this humiliation when he has one of the three witches in the play “Macbeth” say that she has been “killing swine” as an homage to the humiliated demons that they serve. Marie-Julie brings Christ's humiliation of the devil to his face constantly, as she always calls him Quequet, or “little pig” whenever he appears to her. This can also be seen in the English translation of her prophecies, The Prophecies of La Fraudais. Her battle with this Quequet is lifelong, and we see, from what Saint Michael tells Marie-Julie here, that the devil constantly attacks through people and problematic situations. We should expect no different, so we need to keep up our daily Holy Rosary. We can see from this that already some clerical “authorities” are enemies who have been placed into positions of power. A famous historical example of one such enemy occurs during the time of Pope Pius XII: one "cardinal" Rompolla goes unsuspected for decades as he positions many fellow masons into strategic places throughout his long “illustrious” career (that is, he was very careful to appear to be Catholic). The attempt to silence Marie-Julie is long in duration, and denies her the Holy Eucharist for eleven years, but she endures and offers up all of her sufferings. Marie-Julie's prophecies, prayers, and sufferings are very important to what will be the See of the Cross, the Exiled Papacy of Popes Gregory XVII and Gregory XVIII, as well as to the Church Militant, in this time of Exile. This is because God has given a great mission to Marie-Julie, because He knows the great love of this servant of God for Him and His Holy Will, as well as for the salvation of souls (like us). She just wants souls to be saved. She is like the Good Shepherd. She does not want to lose even one. We are being told that our sufferings will not go to waste. They are hard to endure, even a torture at times, but they do produce good results for ourselves and for other souls, if we accept them as God's Holy Will. So let us offer our sufferings up for our own conversions and for that of others! Let us also be careful shepherds, like the Good Shepherd. It is he who will protect us from these diabolical foes who seek to stop us, to damn us with their seeming truths, which are, in reality, lies. The fact that Saint Michael here identifies himself as the "exterminator Angel" is significant. He is not saying that he is an exterminator Angel, but the Exterminator Angel! This recalls to our minds the plague which God sent upon Egypt, where the Angel of Death slayed the first-born male child in the homes that did not worship God, that did not have the blood of the offertory lamb over the lintels of their homes' front doors. Is Saint Michael that Angel of Death? Was it he who did the bidding of Almighty God on that night of Divine Justice? These people in Egypt were punished because they would not worship God as He wished to be worshipped. Christ gave mankind the Church as the way that we are to worship, and this is in communion with His Vicar, the Pope. Christ's Authority is given to His Vicar only. This is how God wants us to worship Him, through our communion with the Holy Father, Pope Gregory XVIII. Those of us who are in communion with Christ's Vicar, Pope Gregory XVIII, will find our protection in Saint Michael the Archangel. He will guide us in the battles that we fight for God, and for His Truth, which can only be found in His Exiled Vicar who is the Head of His Church. May Saint Michael the Archangel always be our defender against the attacks of the lying little pig and his demons. What a good Mother Christ has given us! May we have the joy of praising and thanking Her in Heaven for all eternity! Who is she that cometh forth as the morning rising, fair as the moon, bright as the sun, terrible as an army set in array? (Cant. vi).